In a wonderful email from Tom he tells us about his career. "...My radio life began back in '66 when my dad took me to visit a friend of his, who was working the 6-to-midnight shift at WWOG-(FM 99.9) in Boca Raton and I immediately knew what I wanted to do. I pestered the owner, who also happened to be the chief engineer, GM, and custodian, to give me a job doing ANYTHING. I wound up sweeping floors and emptying garbage cans at cross-town WSBR(-AM 740) for $1 an hour, and eventually worked my way on the air, leaving as news director about two years later! After a few months in Stuart, FL, I was hired at WJNO(-AM 1290) in West Palm where I had the joy of working with the talented likes of Dave Edwards, Ray Marsh, Pete Kaye (who is STILL there! ), Steve Armstrong, Jim Kern and a host of others. Sheesh, I was barely 18! After a few years, I went to Miami's WIOD(-AM 610), then left the state for seven years at General Electric's WGY(-AM 810) in Schenectady, NY. 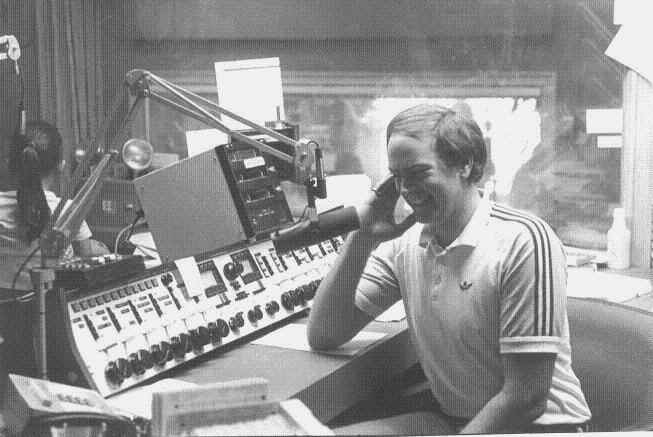 Back to Florida in the 80s at WDBO(-AM 580) in Orlando for several years, then back to the NE. In Hartford for a few, unsavory years, then, like the nomads we radio people sometimes are, I moved to western Washington state where I've been since '92. In the summer of '97, was delighted to join the staff at WARM(-FM 106.9), where I've been doing the morning show. Whew! That's my radio life in a few paragraphs. I have a small voiceover business on the side; Tom Noller Productions under my real name, and enjoy restoring Studebakers when I'm not 'tune-spooning the ballad-salad'!"